Leap outdoors Magnetic Gun Mount, A MUST HAVE for Quick Gun Access and Concealed Carry Storage. Strong, but not too strong which allows for drawing your weapon fast making it better than a holster. This magnetic gun holder can be used to mount guns, extra mags, knives, anything with exposed metal. The possibilities are endless. High grade N35 Neodymium magnet rated at 35 lbs. Single piece metal design, built for strength and durability. No scratching. Thick high quality rubber cover protects your firearms. Includes four self-tapping screws, 3M double stick tape, dry wall anchors, and installation guide. No longer do you need a specific holder for each gun, if the gun has metal you can mount it. Sleek beautiful 3.75"L x 1.4"W x 0.30"H design allows for a low-key concealed gun mount. Countersunk screw holes so the screws sit lower than the rubber cover. Flat smooth metal back provides a secure mount with 3M double sided tape provided. A Halbach array is a special arrangement of permanent magnets that augments the magnetic field on one side of the array while cancelling the field to near zero on the other side preventing interference with electronics and will not magnetize your gun. MILITARY GRADE GUN MAGNET: High quality strong 35 lbs rated rubber coated magnets will firmly hold your firearms without scratching them. Install almost any gun type and model in multiple ways to conceal for quick access or storage. WORKS WITH ALL BRANDS: Beretta, Browning, Colt, FN herstal, Glock, Heckler & Koch, Kel-Tec, M&P, Mossberg, Remington, Rossi, Ruger, Sig Sauer, Smith & Wesson, Springfield, Taurus, Walther, Winchester, and others. 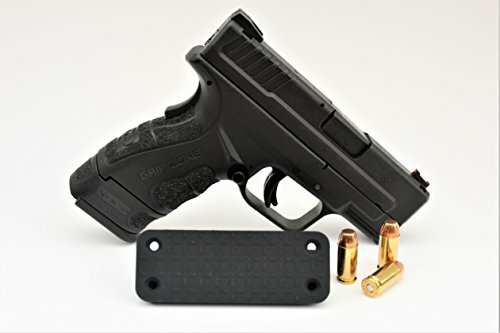 SMALL & STRONG: Our high quality compact 3.75"L x 1.4"W x 0.30"H design allows for a sleek concealed gun mount. Includes 4 black self-tapping screws, 3M double stick tape, and installation instructions. If you have any questions about this product by Leap Outdoors, contact us by completing and submitting the form below. If you are looking for a specif part number, please include it with your message.